I recently presented a webinar on the topic of Chain Migration from Ulster using my Bamford and Nevin families as a case study. If you join the Southern California Genealogical Society you can watch an archived version of the webinar which is available free to members of the society. Here are a few of my favorites images from that presentation. Much of the trouble and the strife in Ireland throughout recorded history has been due to a struggle between Protestants and Catholics. The six counties that comprise Northern Ireland today have been predominantly, Protestant. One of the organizations that was founded by Protestants in 1795 was known as the Orange Order. So I have used the color Orange as the theme of this presentation. My goal today is to inspire you to go to Ireland. As genealogists you will find that there are more and more records coming on line every day. But online records are absolutely no substitute for going there. Even if you have already discovered your Ulster Ancestry and have a fully illustrated published family history to prove it, I still recommend that you go there. There is a process that happens when you walk on the same ground where your ancestors walked. I like to call that process “getting your bearings.” You get a sense of direction and purpose that you really cannot experience unless you go there. 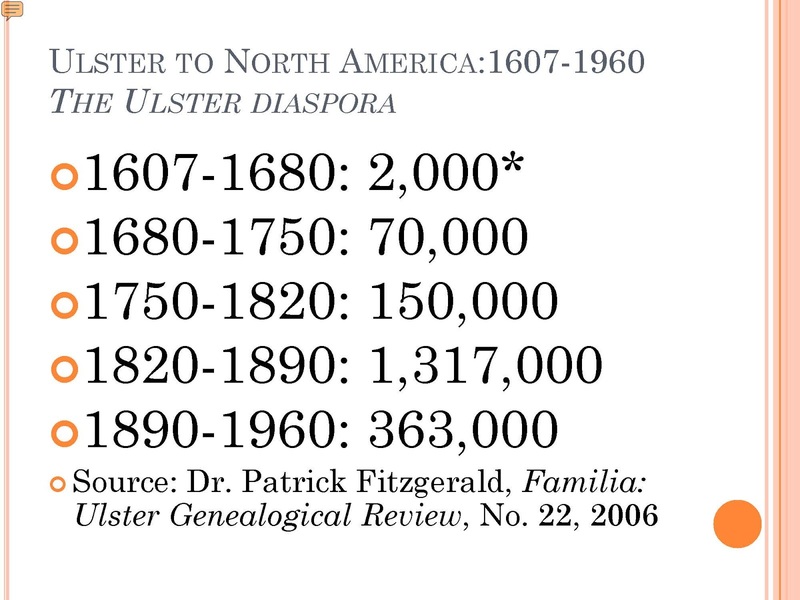 If you take a look at these statistics you will see the numbers of people that came from Ulster during a series of 70 year time periods. During the 1820-1890 period there were also about a half million people that moved to Scotland, England and Wales. Because you had many people from Ulster in Great Britain it is also a good strategy to search for people with your surnames in Great Britain that were born in your subject counties. 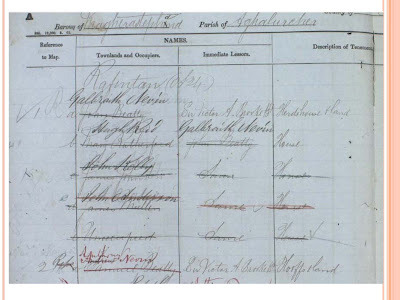 The British census records for example give the name of the county in the birthplace column. In the period of the Famine we have estimates based on the censuses of 1841 and 1851 that close to 300,000 people left Ulster during that ten year period alone. One of the things to note here is the reference to Familia the Ulster Genealogical Journal. I highly encourage you to start reading this periodical for historical context. For example, the December 2005 edition has an article that talks about inheritance being a factor in chain migration. ¢ Chain migration -the social process by which immigrants from a particular town (or family) follow others from that town (or family) to a particular city or neighborhood. 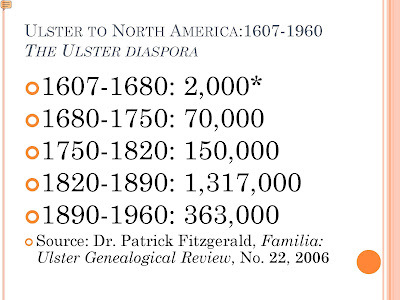 Most immigrants from Ulster came to North America based on the recommendation of a friend or relative from their home town. Perhaps they had an offer of support by the purchase of a ticket and an offer to provide lodging. This process of encouraging your family and friends to immigrate is known as chain migration. 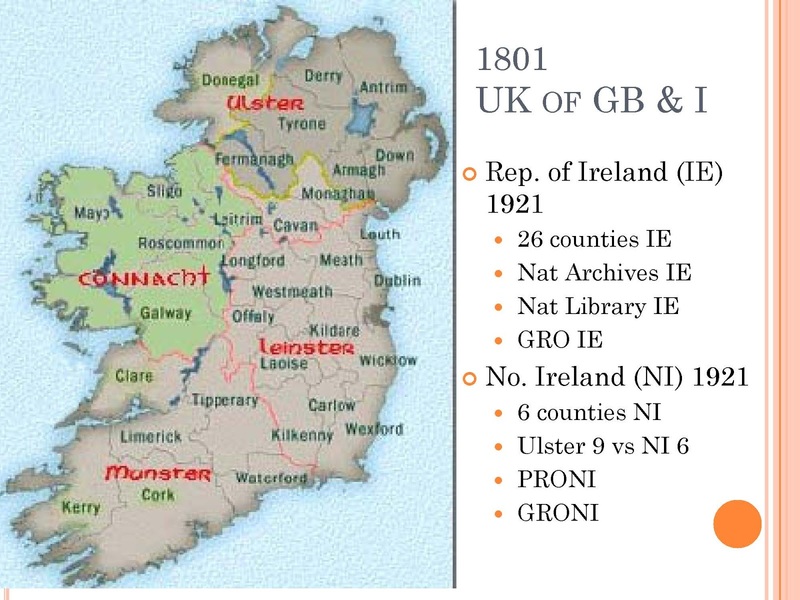 We have seen the map of Ulster in the title slide and we know that there are nine counties in the region known as Ulster and six of those counties remained in the United Kingdom as part of a new country known as Northern Ireland. The counties of Donegal, Monaghan and Cavan became part of the Republic of Ireland. 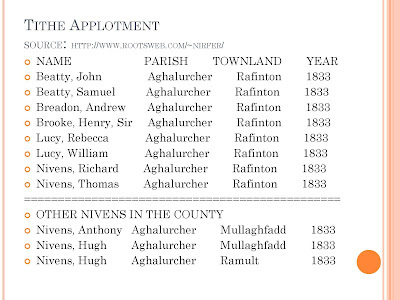 Due to the scarcity of Irish records an excellent genealogical approach is to widen the focus from a particular pedigree to all occurrences of a surname in your Irish locality whether it be a townland, a county or a region like Ulster. Unfortunately, due to fires and government record destruction, you will never have all of the pieces of your Ulster genealogical puzzles." By systematically gathering all records relating to your subject surnames you can effectively piece together an image of your Ulster ancestry. 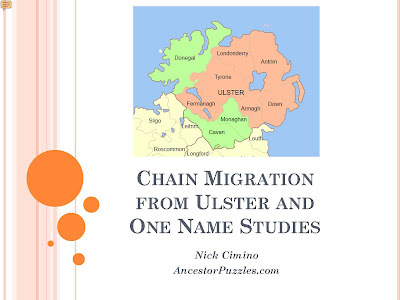 I am going to be using two of my Ulster surnames as a case study to illustrate the principals of Chain Migration and One Name Studies. The scope of this study quickly becomes quite large when you consider all of the descendants of these people. By tracing all of the descendants, I have been able to find written accounts and documents that have helped to tie all of these people together into family groups. However, many mysteries remain. Before we dig deeper into the one name study methodology, let’s talk about the history, geography and government of Ireland. Today the island of Ireland is divided into two countries: (1) the Republic of Ireland, also known as Éire and (2) the Northern Ireland region of the United Kingdom. Eire is represented by the IE abbreviation and URL. The government agencies of Northern Ireland use the uk.gov URL. Northern Ireland uses the British pound as their currency and Ireland is part of the Euro Zone and uses the Euro for their currency. If you are planning a trip to Ireland you will need to carry both currencies if you plan to cross the border. Prior to 1922. the island of Ireland was one country and it was one of the four constituent countries of the United Kingdom together with England, Scotland, and Wales. The language most widely spoken is English but the Republic of Ireland also publishes many of their documents in Gaelic and is actively attempting to preserve and promote Gaelic language and heritage. There are several acronyms here that you need to learn. GRO is an abbreviation for General Register Office which retains the civil records of birth , marriage and death. 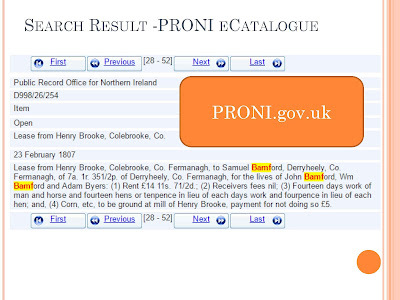 PRONI stands for Public Record Office of Northern Ireland which functions more like the U.S. National Archives. 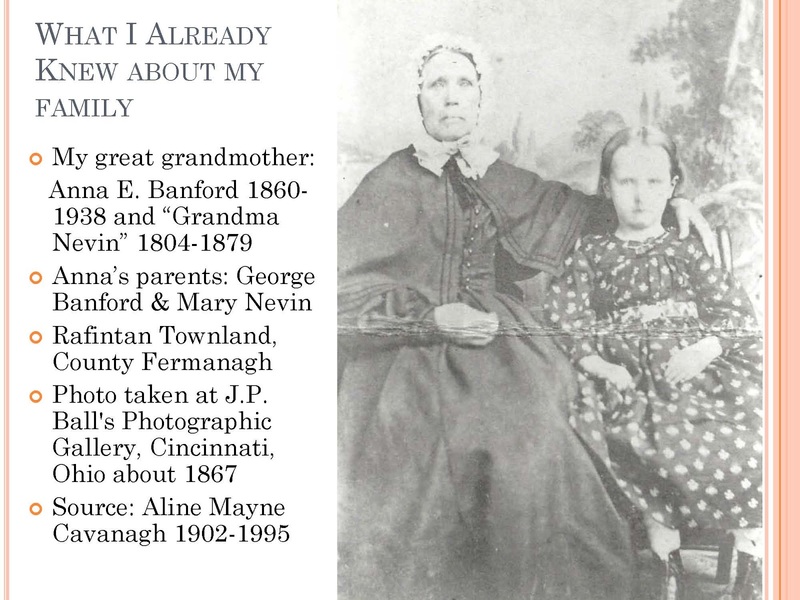 I had collected photos and notes about the Banfords and the Nevins from my Aunt Aline. The girl is my great grandmother Anna Elizabeth Banford. She was born in Schuyler County, Missouri which is on the Missouri and Iowa state line. The old woman in this photograph is shown here as “Grandma Nevin.” Her maiden name was Anne Bamford. Several descendants were named Anna Elizabeth so that may have been her full name too. She was born in County Fermanagh and came to the United States in 1850 with her husband, Thomas Nevin and three daughters. This pedigree chart shows what I know today about my Ulster ancestors. 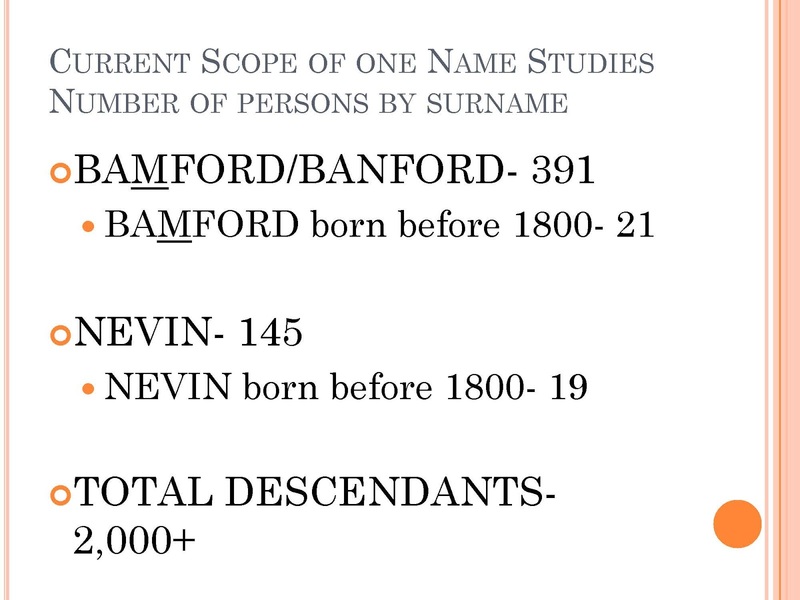 I have learned that there were relatively few people with the surnames Bamford and Nevin in Ulster and especially in County Fermanagh and County Tyrone where I have focused my research. 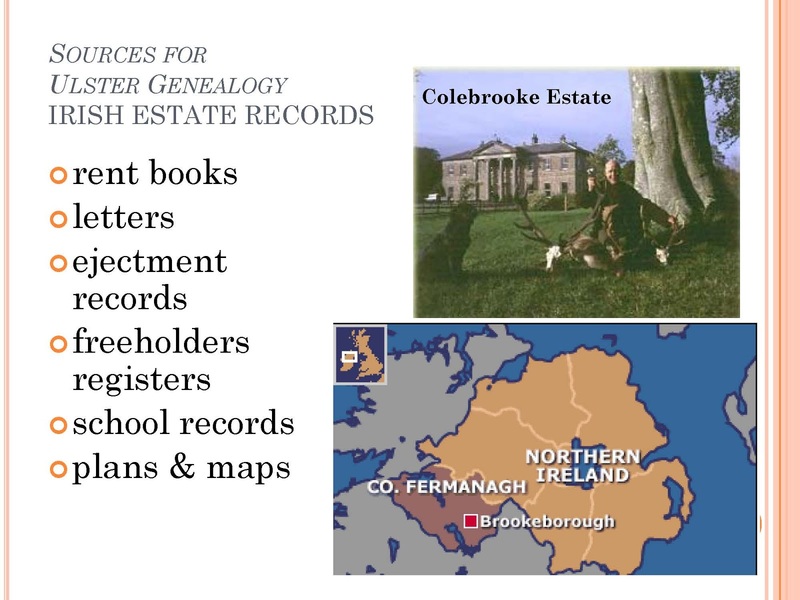 I still struggle to a great extent to find records about these Ulster ancestors but the picture that has emerged has been helped by the One Name Study approach. When I started, I knew that this family group in the large red circle immigrated in 1850. It is not clear whether George Banford was considered a friend or a family member. George immigrated in 1853 and married Mary Nevin in Schuyler County in 1859. George and Mary were living next door to Thomas and Anne Nevin in 1860. Samuel and Alexander in the fourth generation on the pedigree chart are the right ages to be siblings but I have not found any records to support that conclusion. 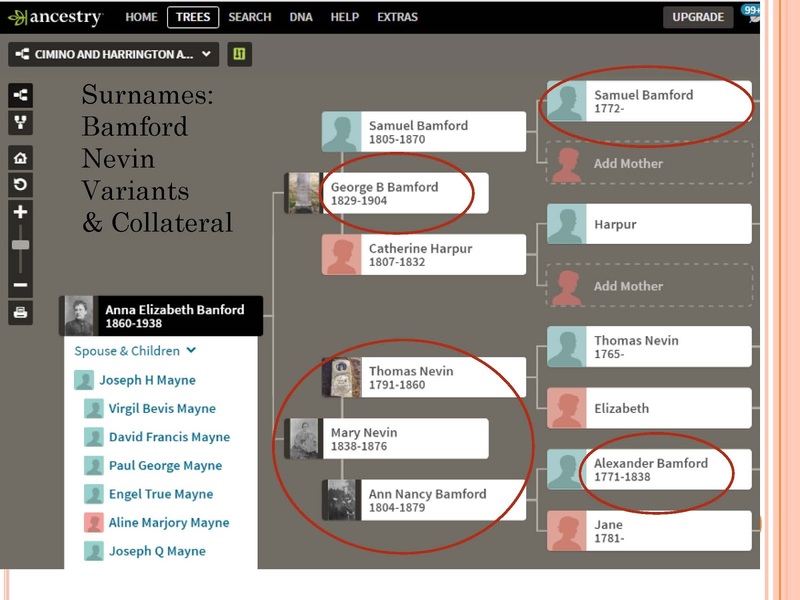 If Samuel and Alexander were brothers, then George Banford and Mary Nevin would share a great grandfather which would make them 2nd cousins. With Irish research sometimes it is better to be lucky than to be good. 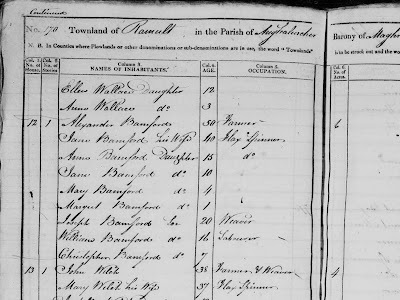 My One Name Study of the Bamfords was incredibly luck to find this 1821 census record of the Alexander Bamford family. So let’s zoom in and take a closer look at this family. 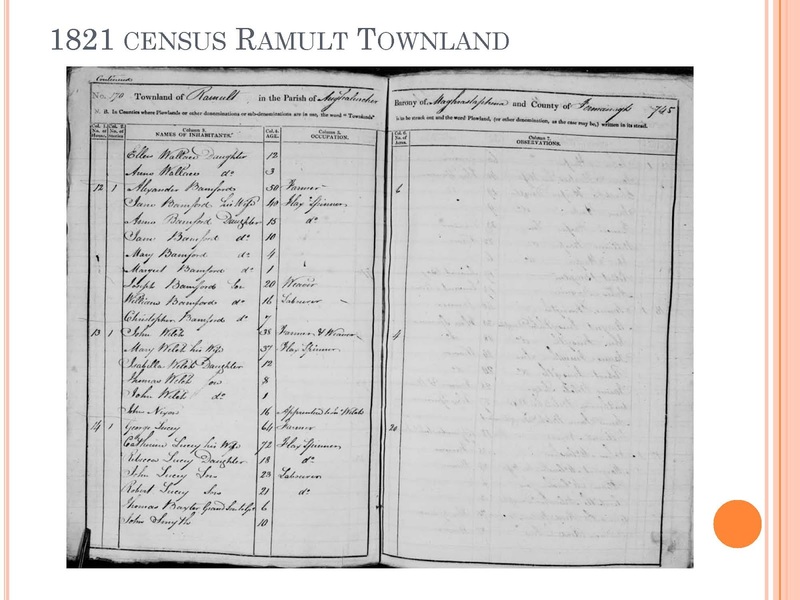 This 1821 record for the townland of Ramult in County Fermanagh shows us just how tragic it was that most of these census records were lost. This 1821 census lists the names of all of the members of the household and states their relationship to the head of household. We don’t get this until 1850 in the U.S. This census also states the occupation of all of the family members that were working. The father, Alexander Bamford was a farmer who apparently was growing flax because his wife, Jane is listed as a Flax Spinner and his son, Joseph is a Weaver. After several years of poring over this census record, I have been able to find that Alexander Bamford was my ancestor. Most of the people in this family immigrated to North America. 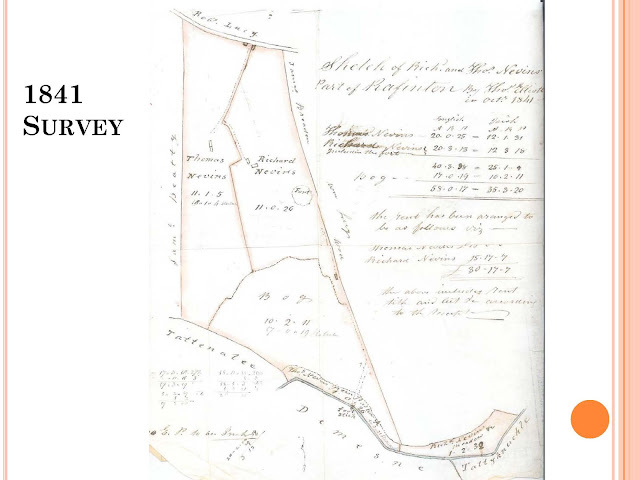 You might not be as lucky to find a census fragment that lists your ancestors but if there is one of these for a nearby location, you might want to pay attention to it because of the social and economic history that it might contain. 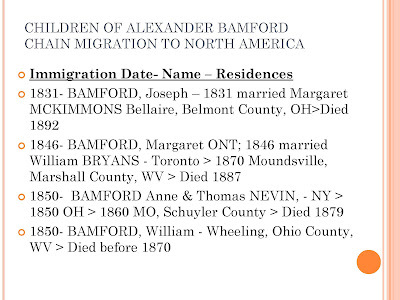 The first person in this chain migration example was Joseph Bamford who was the weaver that we saw in the 1821 census. We have not been able to find him on a passenger list but we know that he was married in April 1831 in Belmont County, Ohio and that he lived there until he died in 1892. From 1831 to 1850, he must have kept in contact with his siblings as three of them would end up residing near him. Margaret Bamford immigrated from County Fermanagh to Canada some time prior to 1846 when she married William Bryans in Toronto. The Bryans family lived in Port Stanley, Ontario for at least 20 years and prior to the 1870 census they migrated to the U.S. and settled in Moundsville, West Virginia which is across the Ohio river from Belmont County, Ohio where her brother, Joseph Bamford had been living for almost 40 years. Thomas Nevin and his wife, Ann Bamford immigrated in 1850 with their three daughters. In 1850, we find them living with Ann’s brother, Joseph Bamford in Belmont County, Ohio directly across the river from Wheeling, West Virginia. By 1860 Thomas and Ann Nevin had settled in Schuyler County, Missouri where they lived the rest of their lives. 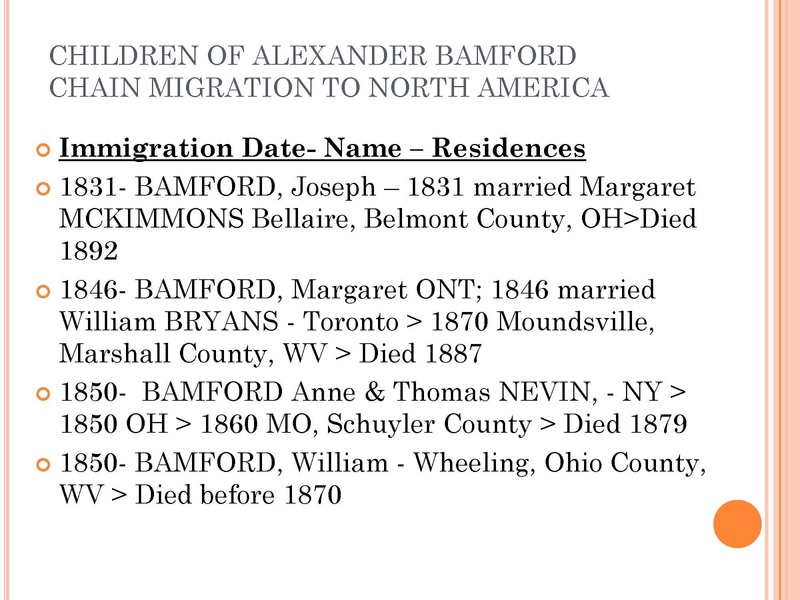 William Bamford was a brother of Joseph and Ann and he immigrated about 1850 and went directly to Wheeling, West Virginia. He was married twice in Ireland and had five children in Ireland and was married a third time in Wheeling and had five children with his third wife. 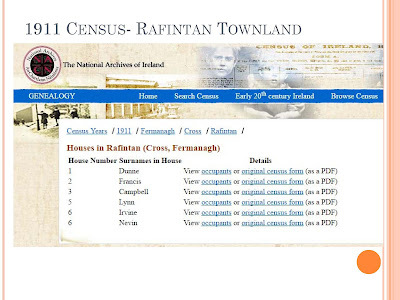 This is screenshot of the 1911 Census website sponsored by the National Archives of Ireland. These records appear to be complete for the entire island. 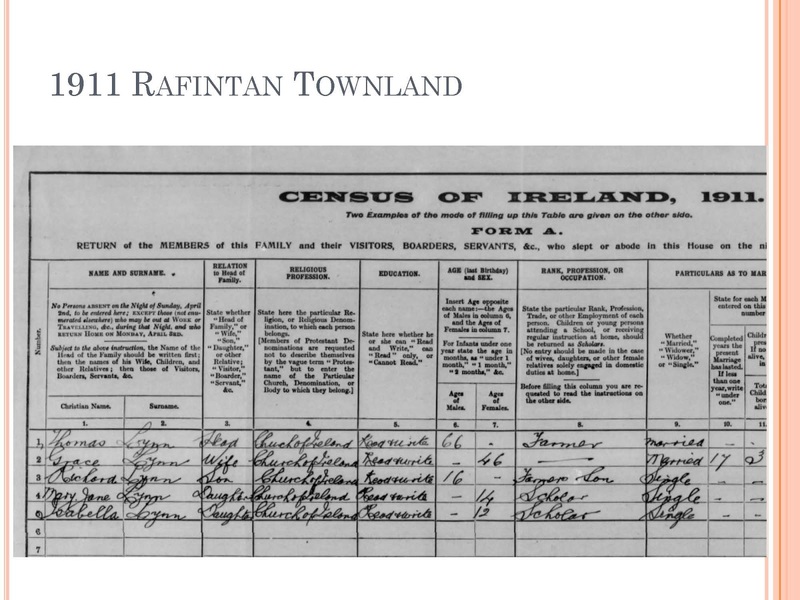 You can see that this is a listing of the surnames found residing in the six households in the Townland of Rafintan. In house six, you will notice that the head of household is named Irvine and that there is also someone named Nevin living in that household. It turns out that this is a widow probably living with her daughter’s family. 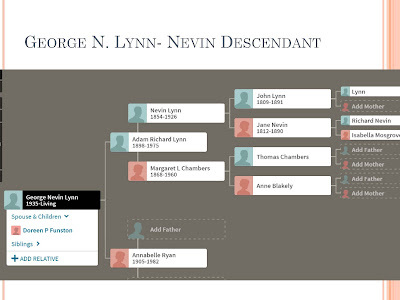 But for demonstration purposes, let’s look at the Lynn family. 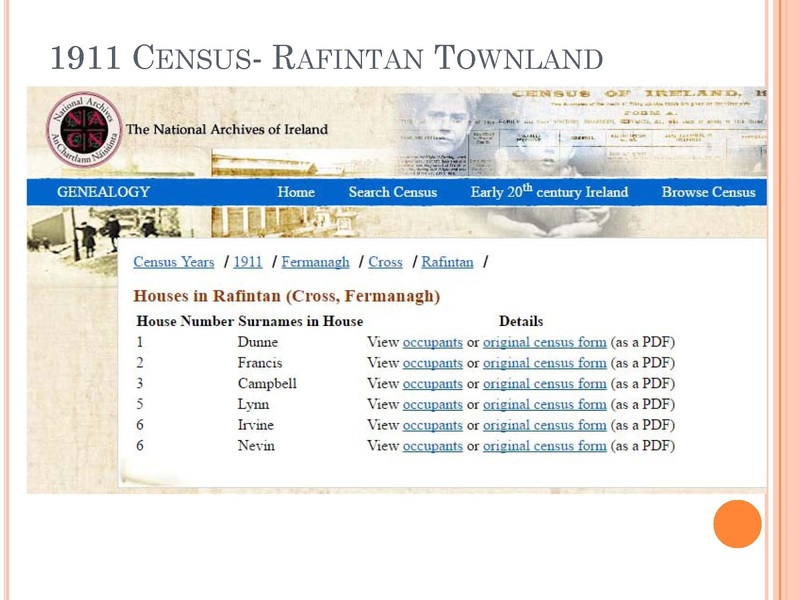 This is the transcribed list of occupants and again we should repeat that this census database was sponsored by the National Archives of Ireland. We see that the head of household was Thomas Lynn and that his wife was Grace. 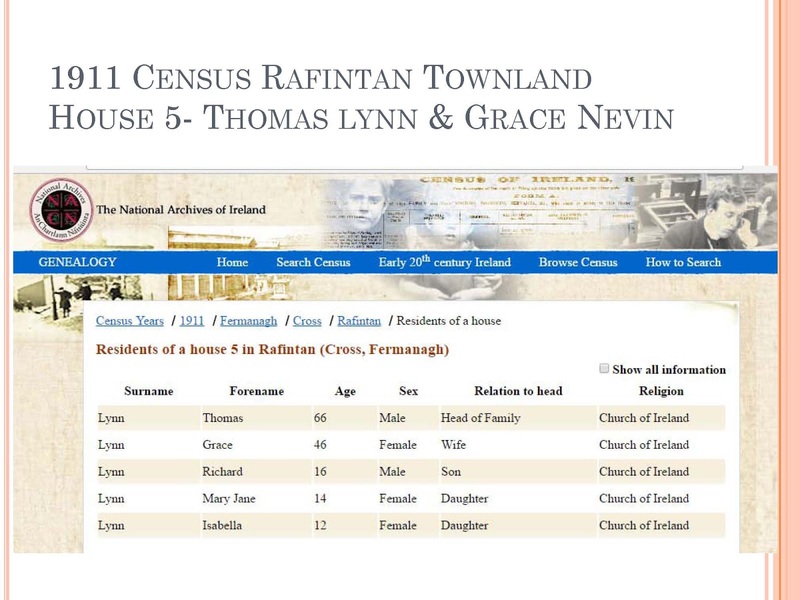 I was able to find a marriage record for Thomas Lynn and Grace Nevin and I was able to determine that both of them are Nevin descendants. 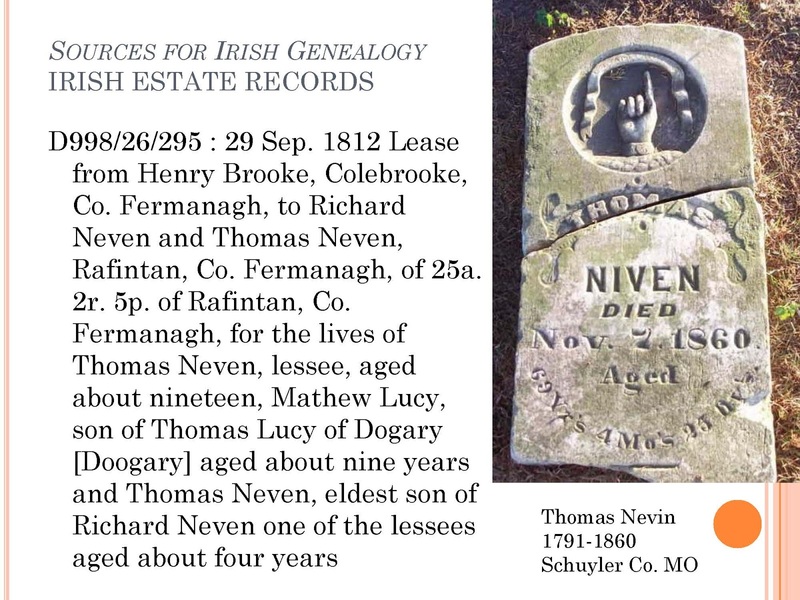 The mother of Thomas Lynn was Jane Nevin. The father of Grace Nevin was Galbraith Nevin. 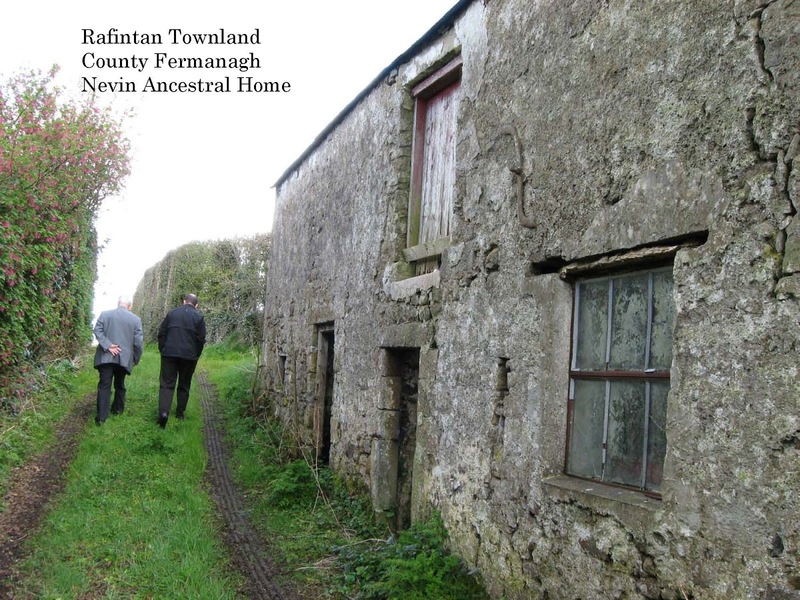 The landlord for the Rafintan townland was the Brooke Family. 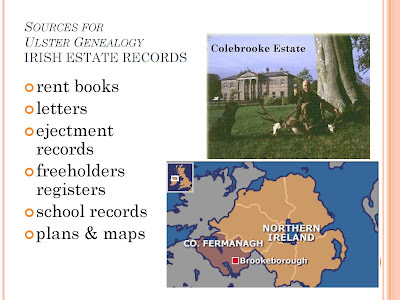 Their manor house is called Colebrooke and the nearest town is called Brookeborough. 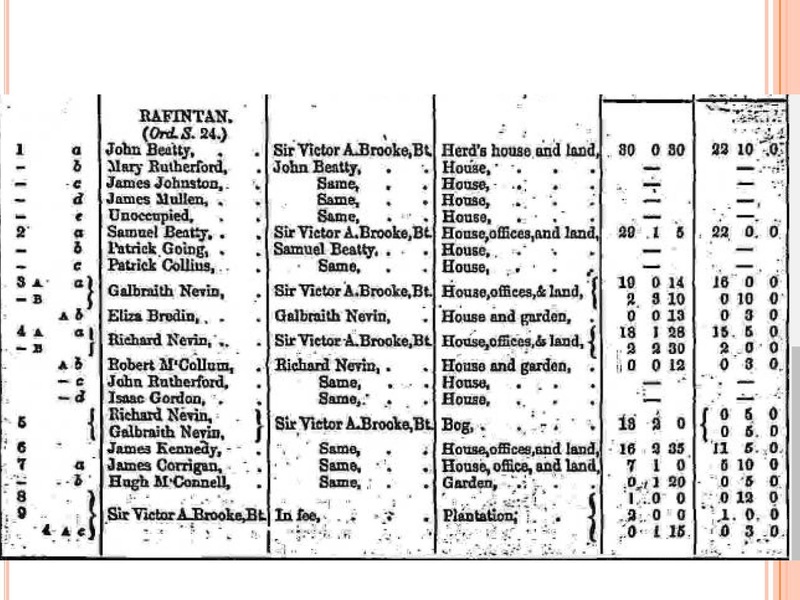 When I was in Ireland, I went to the Public Record Office of Northern Ireland and looked at the Rent Book for the Brooke Estate for 1851. 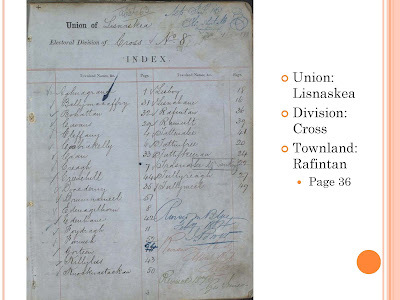 The book shows the names of the tenants in the townland of Rafintan and the rents collected. 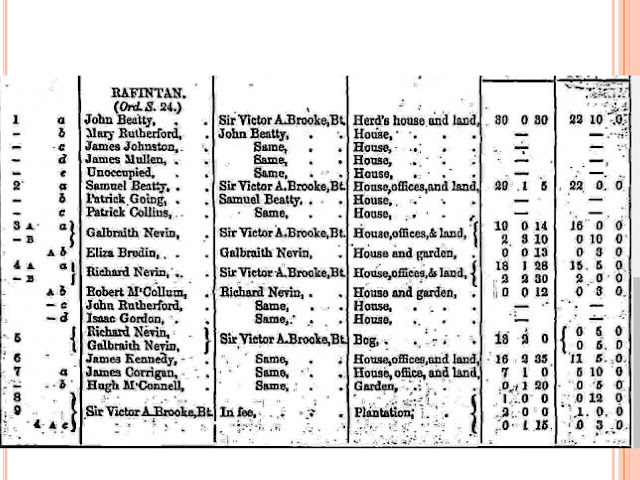 The listing for my ancestor Thomas Nevin shows a half year's rent due May 1851 of £7, 10p, 5 1/2d that was paid by Galbraith Nevin. This would indicate that Thomas Nevin and family had left Ireland and that they had transferred their interest in the land to Galbraith Nevin. 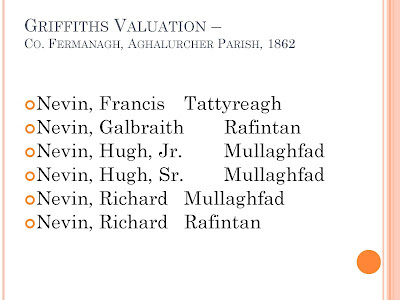 When we dig into the Griffiths valuation we will learn how to trace the transfer of ownership of the lands of Rafintan. 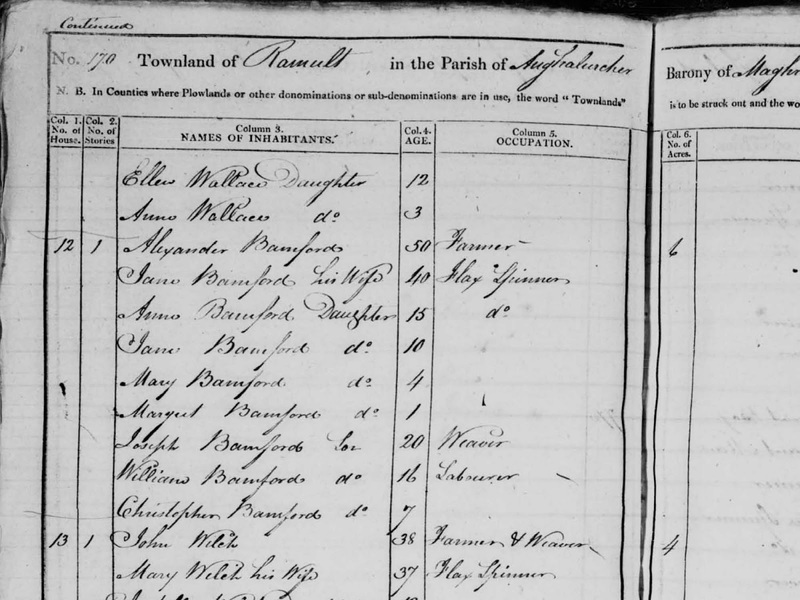 Here we see the original image for the 1911 census listing of the Lynn family. There is some additional information here about education levels and occupations and in the far right column it gives the County of Birth. In the case of this family, they were all born in County Fermanagh. One of the things that I also want you to notice are the first names of the children: Richard, Mary Jane and Isabella. The gravestones of Ulster are particularly valuable because you find several members of the family listed on the same gravestone. 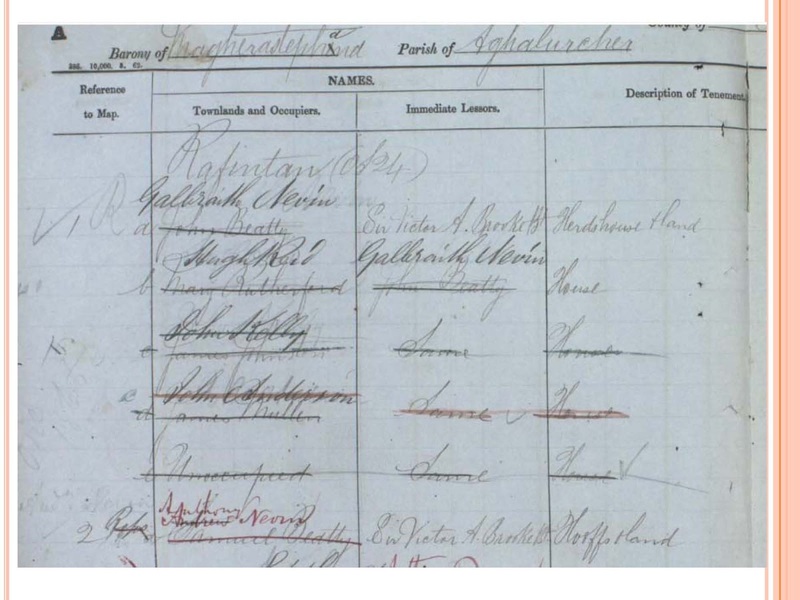 Here is an example that helps to tell us more about the Lynn family that we just saw in the 1911 census. Thomas Lynn is clearly noted as a resident of Rafinton. He and his wife and children are all named on this stone with their dates of death and their age at death. This is like having a family group sheet printed on the gravestone. I will tell you now that I had to go to Ireland to get this picture. 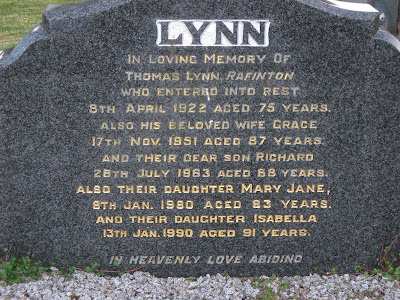 The daughters, Mary Jane and Isabella were the last known residents of the farm in Rafintan so before I made my trip, I was very interested in finding anyone named Lynn that resided in County Fermanagh. One of my strategies while planning my trip to Ireland was to look for people in County Fermanagh with the names Bamford and Nevin in the online version of the British Telecom white pages. 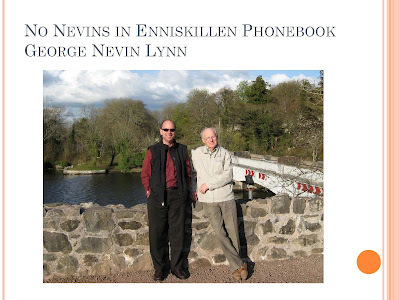 There were no Nevins. 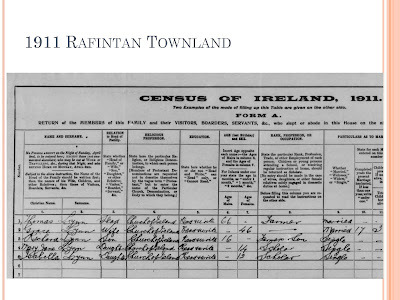 So since I knew that the Lynns had occupied Rafintan townland, I also looked up the listing for the Lynn surname. I got really excited when I found a listing for George Nevin Lynn. So I called him up with my International calling card and let him know we were coming to Northern Ireland. He met us at the Town Hall gave us a tour of the area and took us home for dinner. I was able to get enough information from him to determine how he was connected to the Nevins. After I interviewed George Lynn in Ireland and looked at his family documents, I was able to piece together his family history when we got home. As you can see he was in fact a Nevin descendant. 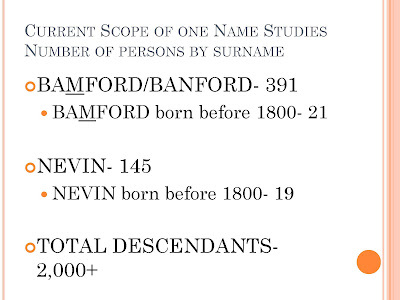 George had Nevin as a middle name. George’s paternal grandfather had Nevin as a first name and his great grandmother was Jane Nevin daughter of Richard Nevin and Isabella Mosgrove. Bertie Morrow was a retired postman that was introduced to us by some Banford descendants. 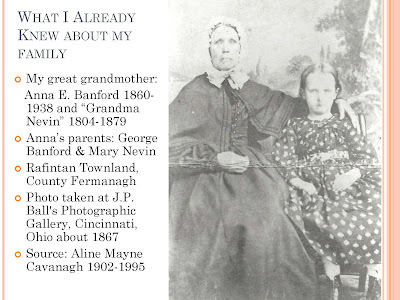 I tracked down a Banford descendant in Canada who had connections with a woman name Betty Warrington who lived at Fivemiletown on the Fermanagh Tyrone border. I called Betty and let her know we were coming and when we arrived she set us up with Bertie as our tour guide. Bertie took us to see properties in Fermanagh and Tyrone that he knew were connected to Bamfords. And later, Betty and her brother, Wilfred Anderson took us on a tour of their family homesteads and cemeteries. Keep in mind at the time we went, we were not sure if any of these people were actually related. We only knew that they had some connection with either Bamford or Nevin. 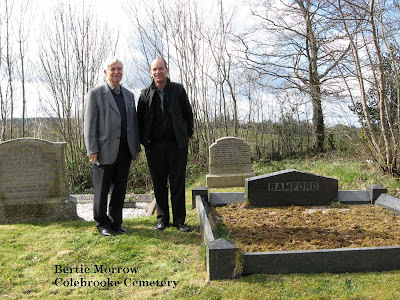 The picture above is the Colebrooke Cemetery and the grave that we were visiting was in a Bamford family plot. Copies of the Valuation are widely available in major libraries and record offices, both on microfiche and in their original published form. The dates of first publication will be found under individual counties. 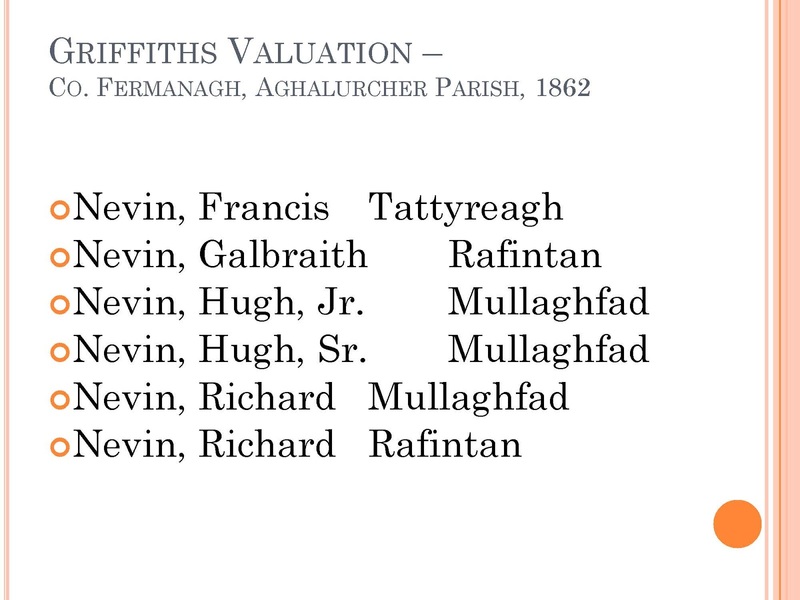 The Surnames section of this site provides counts of the number of households of a particular surname recorded in the counties and civil parishes of Ireland, based on the returns of Griffith's Valuation. Over the last several years PRONI has been in the process of adding these Valuation Revision books which are the original records that were the source of the Griffiths valuation. These books are currently searchable by place name so again we are using Rafintan as an example. You can see here that there are a series of books ranging from 1864 to 1929. My ancestors had already left Ireland during this period but many of their siblings and cousins remained there. When you click on the links you get to the original images which start here with the cover. The title of the book is General Valuation of Ireland. 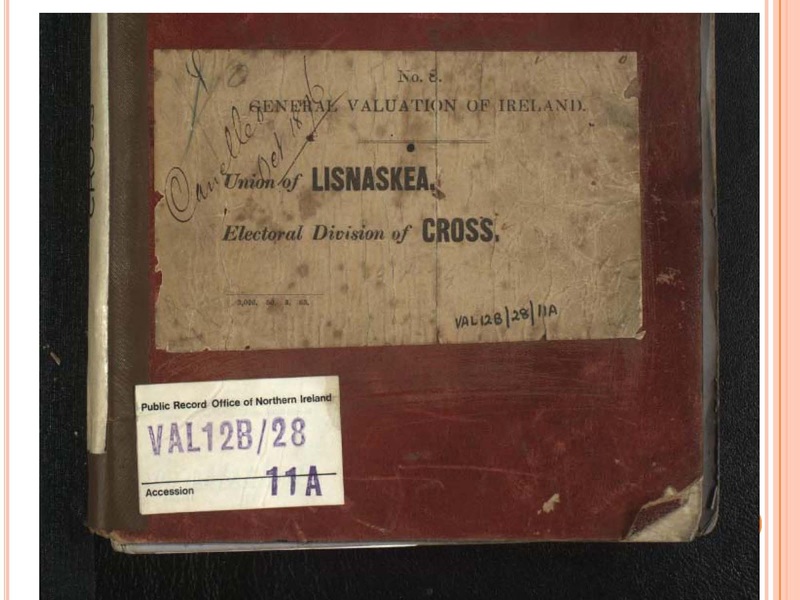 Rafintan was in the Union of Lisnaskea and the Electoral Division of Cross. VAL 12B/28/11A is the PRONI reference number which should be included in your source citation. 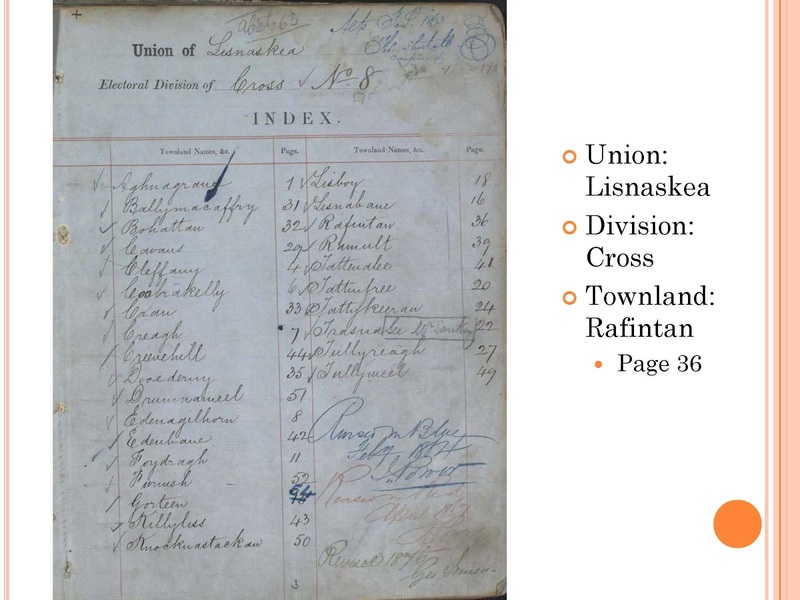 This is an index page which shows which page each townland is listed. So we page forward to Rafintan on page 36. 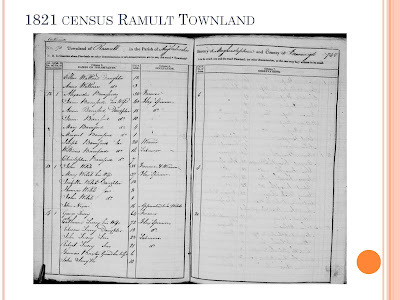 You may also notice that the townland of Ramult is on page 39. So now we are on page 36 and you see that the tax collectors used the same book over a period of years and crossed out names when a new family occupied a farm. 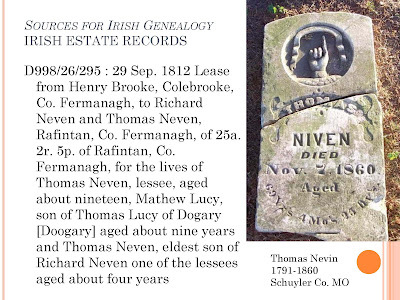 I have told you a little about Galbraith Nevin that he paid the rent on the farm of my ancestor Thomas Nevin in 1851. Sir Victor Brooke was the lessor of the land and he was also known as the Lord of the Manor. Galbraith Nevin also became a lessor after the departure of John Beatty. At the bottom of the page you will see that Anthony Nevin took over the land of Samuel Beatty. So make a mental note of these names as you will continue to see them in other records. As you step back further in time, one of the alternatives to census records are the tithe applotment records. The applotment books for each parish give the names of the occupiers, the amount of land that they held and the value assigned to it. The owners or lease holders were required to pay a tithe to the Church of Ireland. 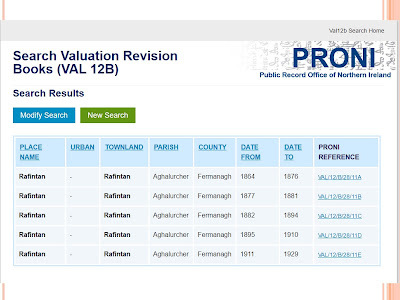 This example shows the owners and occupiers of Rafintan townland and the other Nivens listings in the County. 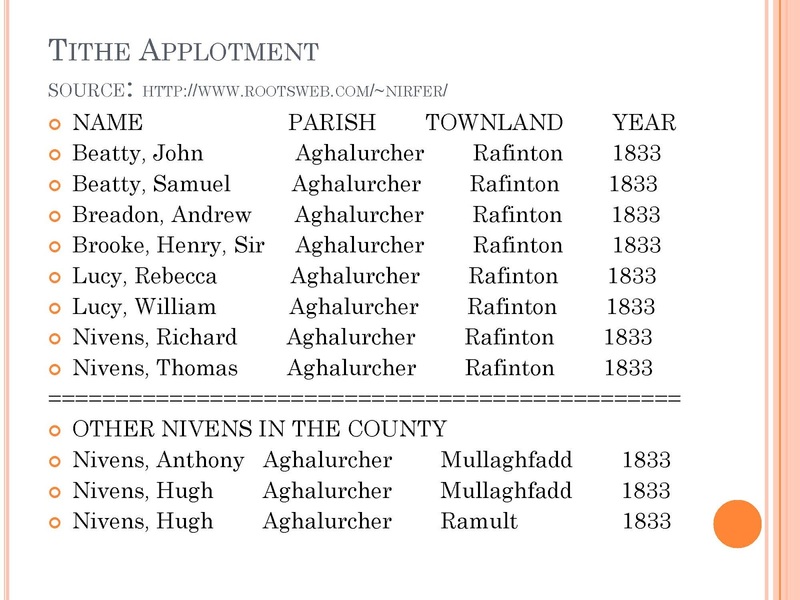 Richard and Thomas Nivens were resident in Rafintan in 1833. Unfortunately there is no descriptive information to state their ages. You remember Samuel Beatty was one of the occupiers in the Valuation Books. This gravestone was marked at the bottom with the words that I have superimposed here: the Family Burying Ground of Samuel Beatty, Rafinton. This gravestone was located in Colebrooke Cemetery. 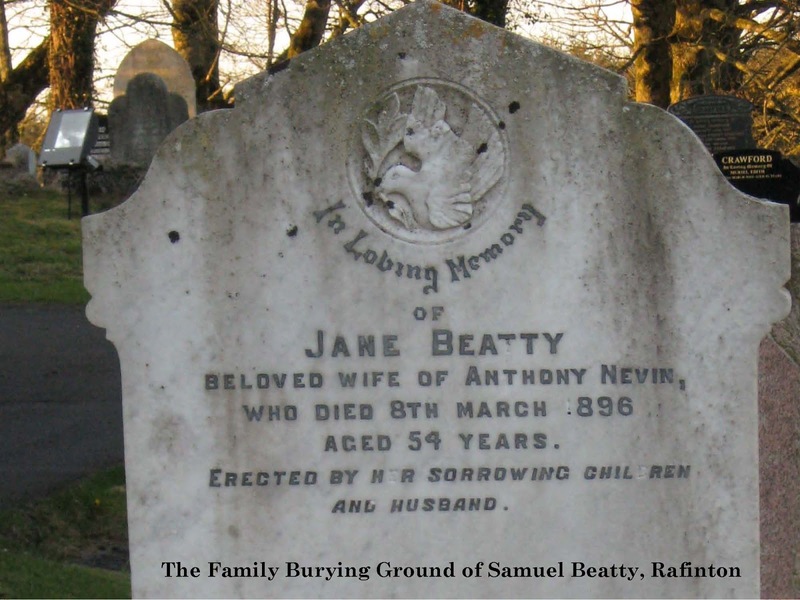 You can see that the wife of Anthony Nevin was Jane Beatty and that she died in 1896. The marriage record of Anthony Nevin and Jane Beatty confirms that Samuel Beatty was her father and it also states that Anthony’s father was Galbraith Nevin. 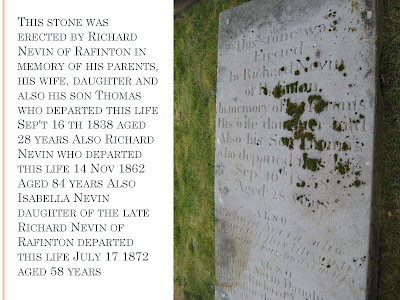 This stone clearly states that Richard Nevin was a resident of Rafinton and that he had a daughter named Isabella. The family history notes that I received from my Aunt Aline stated that Thomas Nevin had a brother Richard who had a daughter named Belle. Belle is a nickname for Isabella. 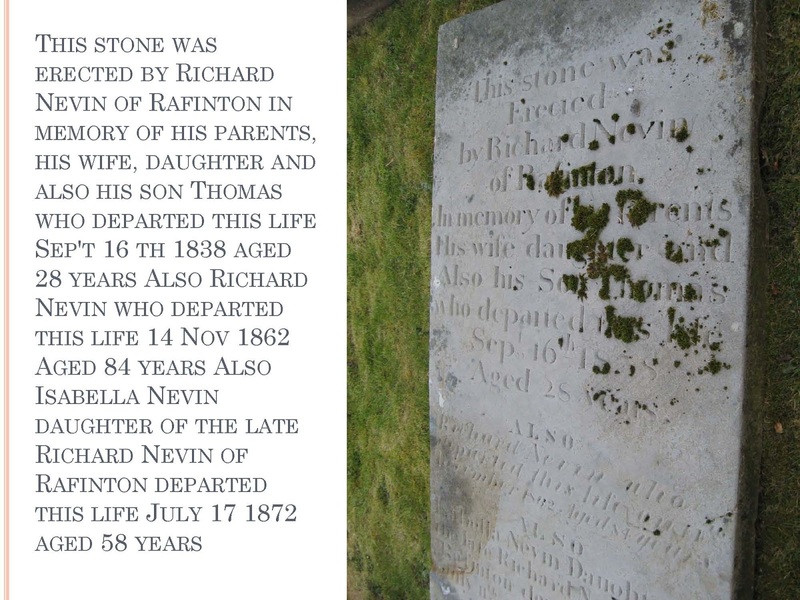 So based on these facts I have made a tentative conclusion that Richard Nevin on this gravestone is the brother of my ancestor, Thomas Nevin. 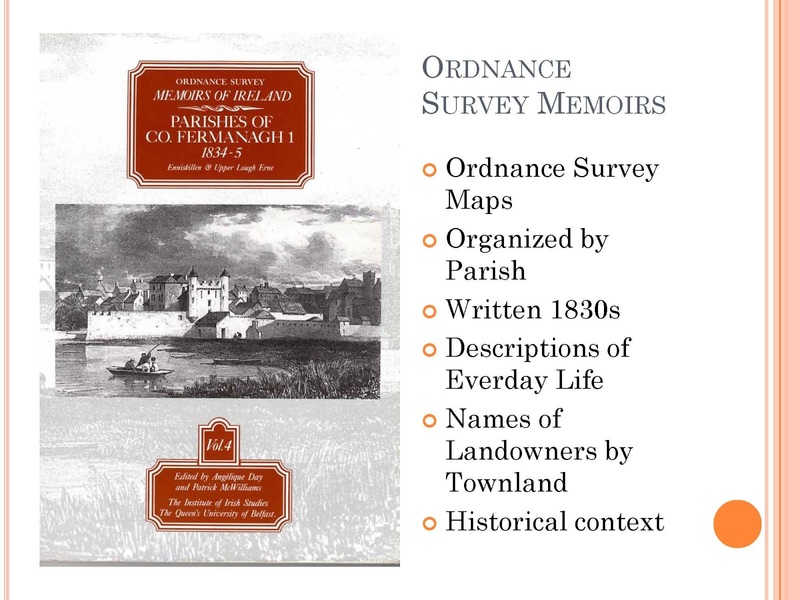 For more historical context on your Ulster Counties, I recommend that you get a copy of the Ordnance Survey Memoirs for your county. These books were compiled by the staff of the Ordnance Survey. The best way to describe the Ordnance Survey is that they were the map makers similar to our U.S. Geological Survey that produces the topographic maps of the United States. The memoirs are a snapshot of everyday life in the 1830s when the maps were first being made. These memoirs were published in the 1980s and 1990s by the Institute of Irish Studies at Queen’s University of Belfast. There is a section on each parish in the county. The descriptions include the natural features such as hills, lakes, rivers, bogs, woods and climate. The towns are described including their history, the buildings, and the occupations of the local population. The economy is described listing the principal industries and the local agricultural methods. 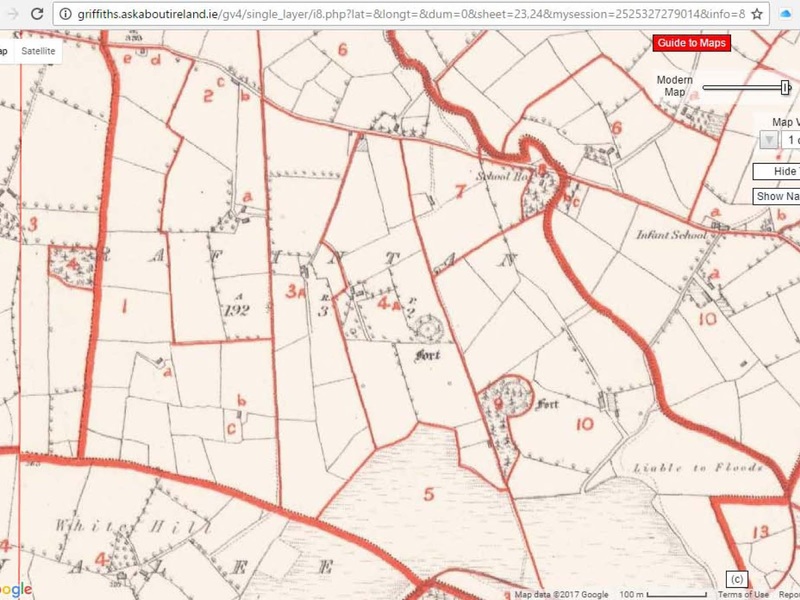 The principal landowners are featured in some detail with lists of the townlands on their estates. These books provide very helpful historical context for the everyday life of your Ulster ancestors. Few people realize that many of the landed estate owners kept detailed records of their estates, including records of their tenants. These estate records are invaluable for the genealogist and many of them are held at the Public Record Office of Northern Ireland. The diversity of sources found in estate records is amazing. 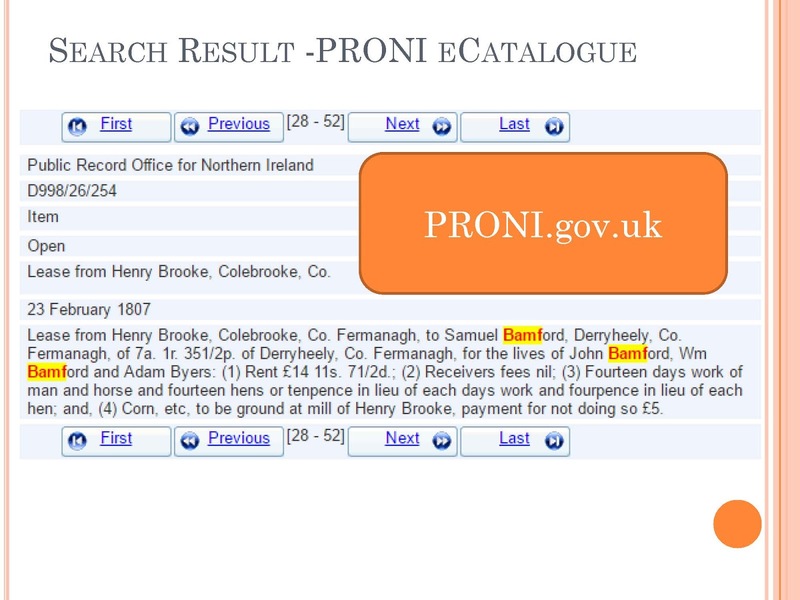 The PRONI website has a description of estate records. Suffice it to say that there are plenty more records for me to explore when I return to the Public Record Office on my next visit to Belfast. An interesting side note to the Irish estates is that since they have been divested of their land, the current owners have had to come up with a variety of schemes to maintain these massive houses. You can see the Lord of the Manor here advertising his deer hunting adventures. The latest scheme is the Colebrooke Spa which was developed in a reality TV series. There is a new URL for PRONI the Public Record Office of Northern Ireland. PRONI.GOV.UK is short form URL that I show in the orange box here and still works. I spent five days at PRONI and only scratched the surface of their archival records. Before you go, I encourage you to spend lots of time with their extensive web resources. I only have time to show you one example of a document that is extracted in their E-catalog. Notice that I searched on just the first four letters to try to find variant spellings. 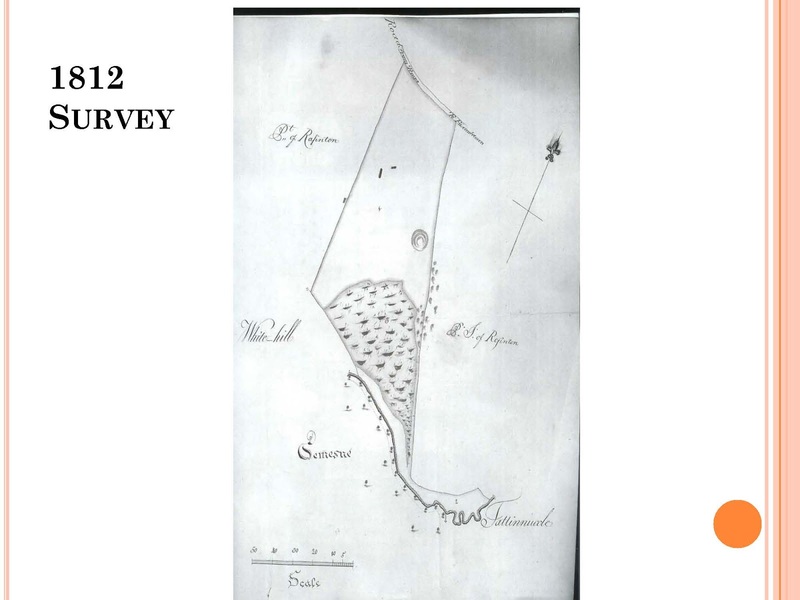 This is the survey drawing of that lease dated 1812. The area on the bottom of the image is the demesne where the Brooke family lived. There is the name of an adjacent townland named Tattynuckle with an alternate spelling but otherwise there is very little detail. By 1841 the property had been split between Thomas and Richard Nevins so that they both had 11 acres. Some of the adjacent lease holders are named as well as the names of some adjacent townlands. My ancestor, Thomas Nevin left Ireland nine years later so this shows the land that he left behind. This is how the land looked in the 1860s from the Ordnance Survey maps for the Griffiths valuation at the askaboutireland.ie site. The parcels that are labeled 3A and 4A are the Nevin parcels. Parcel 5 is the bog. Here is the legend to the Griffiths Valuation Map and it shows that Galbraith and Richard Nevin were leasing land and subleasing land to other tenants. In conclusion, here is a picture of Bertie Morrow and I in 2008. We were walking up the muddy road on the Lynn property which previously belonged to the Nevins. This was the same property where my ancestor, Thomas Nevin lived prior to immigrating to the United States in 1850 and here I was over a 150 years later walking on that same ground. When we went in 2008, the signs of the Irish Troubles were evident everywhere we went. A shaky peace had been established which reduced the level of violence between Catholics and Protestants to the point where it was safe to travel there. The people were ready for peace and reconciliation. They were ready to accept their American cousins with open arms. The people were so gracious and welcoming. The Irish now realize that genealogical tourism is an important part of their economy and they have been working hard to maintain the peace for a decade. So go there. Now!